Planning a high school or college graduation party? We've got the perfect solution for inviting your guests in style. 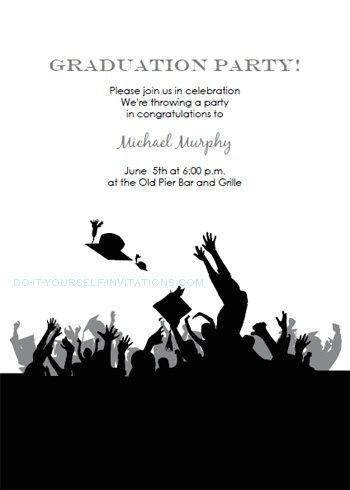 Use our free printable graduation invitations templates to print and create your own homemade graduation party invites. The templates are easy to use. Just download the interactive PDF file. 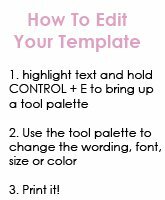 Open the template, highlight the text you wish to change and press "control" and "E" at the same time to bring up a text formatting tool palette. Personalize your invite by changing the wording, fonts, font color and size. Print the invitations onto a heavy cardstock of your choice. Trim them to 5" by 7" invites by cutting on our handy cutting guideline marks. Pop them into an envelope and into the mail! Making your own homemade invites with our templates is actually pretty easy. However, take note that you will need a PDF reader installed on your computer in order to open, view, change and print your template. But don't worry, most of us already have Adobe Reader installed on our computers. If you don't happen to have it you can install it for free from Adobe.com. 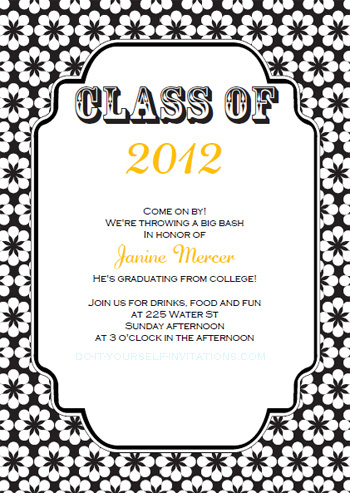 I recommend that these free printable graduation invitations are printed onto a heavy cardstock. Since both templates are mainly black and white, you can even use colored paper! Always run a test copy to make sure everything is printing correctly. The template is set up to print two 5 by 7 invitation per single sheet of 8 1/2" by 11" paper. After trimming each sheet will create two invites! I like to use 110 lb. white cover stock to print off all of my invitations. Remember, some printers may not enjoy running such a heavy paper through the tray. I find that printing always goes the smoothest wen I run the paper through the manual or rear tray. For the very best results always print your templates using the high quality settings for your printer. Trust me, the difference is quite stunning. If quality means more to you than ink consumption than this is the way to go! Stay up to date with the newest tutorials, free printables and giveaways!